2 Large Supermac’s Meals Voucher. Tasty! Here’s a reward you can really get your teeth into – two large meals at any Supermac’s. Choose from 5oz Fresh Burger, Fresh Breaded Chicken Burger or Snack Box (2 x Chicken Fillets and Fries). Supermac’s has over 100 family restaurants across Ireland, offering traditional fast food such as prime beef burgers, succulent chicken and delicious fries. At Supermac’s, you’ll find quality is always the menu. Click ‘Redeem’ and your 2 Large Supermac’s Meals Voucher will be on its way to you by email within 2 working days. 1. 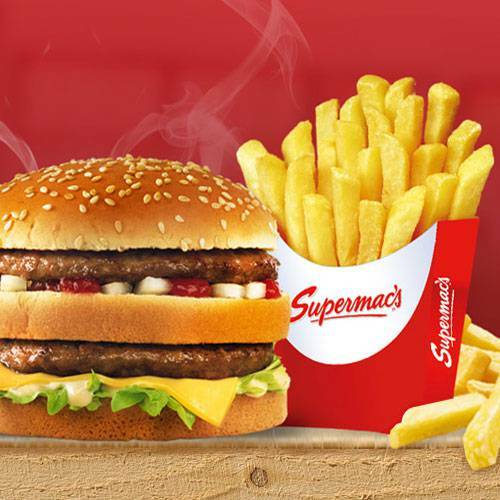 The Reward provided by Supermac’s Ireland is for 2 x premium large meals including 2 large fries and 2 large drinks from the following choices: 5oz Fresh Burger, Fresh Breaded Chicken Burger or Snack Box (2 x Chicken fillets and fries). 2. This reward can be redeemed at any Supermac’s locations by presenting the unique voucher code in physical form (paper) to any of the Supermac’s employees at point of purchase. 3. The offer is valid for one voucher. Both meals to be redeemed at one time. 4. The voucher must be printed off and handed to the staff member at point of purchase. 5. The promotion is not valid in conjunction with any other promotion. 6. The promotion is not open to employees of Supermac’s, TLC Marketing or Dulux.